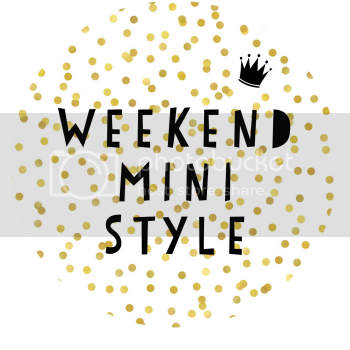 Last weekend was a really busy one for us as we had a wedding and a christening to attend! We had such a lovely time at both and it meant that we got to dress up in our fancy clothes all weekend which is always so much fun. Of course I had Zach's outfits planned weeks in advance, and I think that the one I'm sharing today might be my favourite of all time! 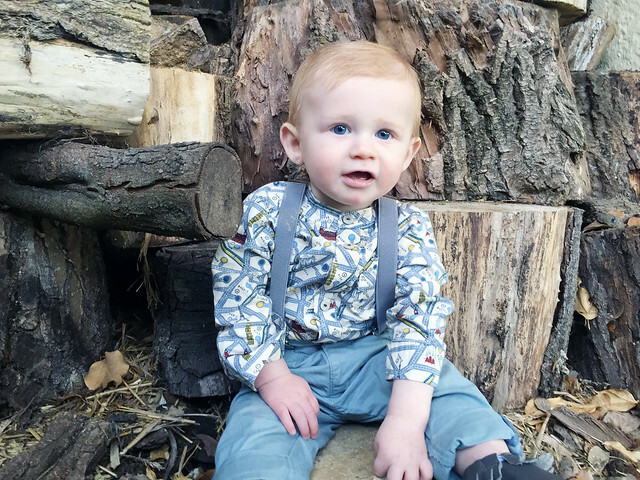 At the wedding I found a little shed with a a log pile and I practically ran over to it as I knew it would be the perfect backdrop for some photos of my handsome boy! We were given this beautiful shirt when Zach was born from our lovely friends Baker and Charlotte. I absolutely love maps so this is right up my street. It has the names and landmarks of various European cities on a street map which I think is really cool. I love the detailing on it, especially the neckline which is a bit different than most shirts as it doesn't have a collar. 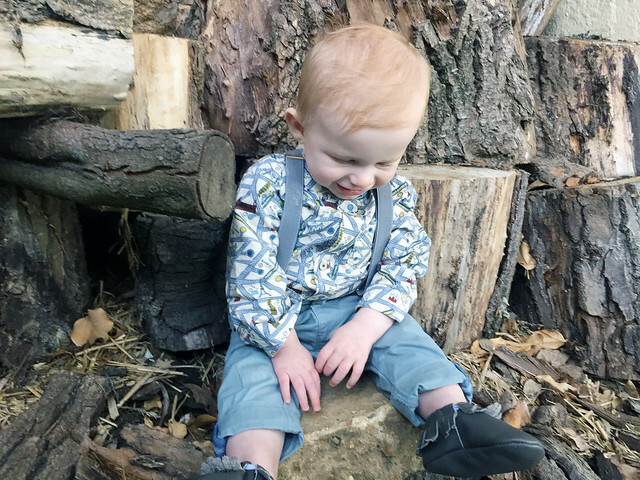 I teamed it with some gorgeous little chinos which I have actually shared before in one of my first outfit posts! 8 weeks later and they still fit perfectly despite being sized 3-6 months and Zach being nearly 8 months old! I added the braces which make the outfit look so much smarter, and of course his little moccasins. 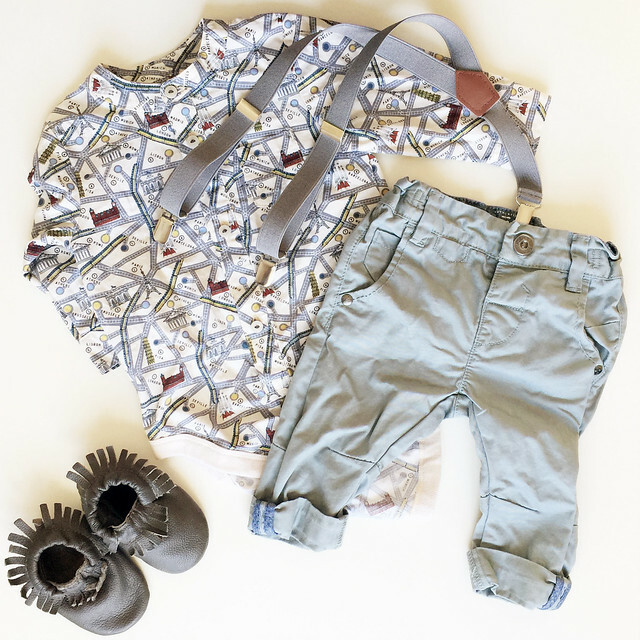 The cutest little outfit ever, I've noted some of this down for Noah now. Completely adorable. We have that shirt too! Isn't the print just gorgeous (I have a thing for maps too), and I love that it has no collar so it doesn't get in the way of bibs and things. The only thing we found was that it doesn't stretch, so Santi outgrew it quite quickly. It looks so cute with grey chinos and moccs.